Socks belongs to our 11 year old grandaughter. We had both here for a couple weeks in July. Socks is very sociable, extremely easy to catch, patient with kids, saddling, messing with him, etc. He loads, trims and shoes very well. 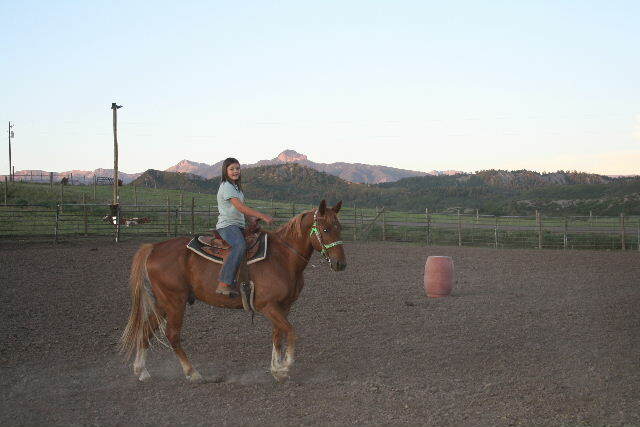 We had he and our granddaughter push cows, ride trails, go over rough country and logs etc, which he did well. He doesn't appear to be "hot" or difficult to handle or mount or deal with. He enters the arena pretty calmy and works well. He is quite fast at barrels and poles, but is easily controlled with a tie down. He's just a nice horse that is too fast for a gal who really wants to face life at a more leisurely pace. For a youth who wants to be competitive and has had some experience with barrels and poles, he should work very well.